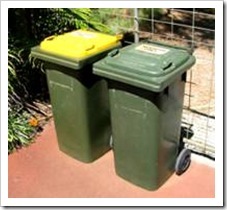 The good thing about our situation is that we have two big bins outside, one for general waste (the green one in the photo) and the other one for recycling (the yellow one in the photo) and as a family, we do a lot to recycle. The recycling bin is emptied once every fortnight and it is always full by then. 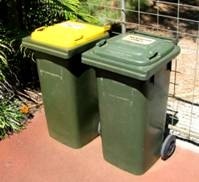 If we forget to take the rubbish bin out for collection for some reason, we need to go and put some of our rubbish in the neighbor’s bin (we sneak out at night, fully embarrassed, to do this). The thing that has worked best was the garbage disposer. If you can have one and your kitchen and piping is suitable for it, I highly recommend it. Just scrape the food off the plates into it, grind for a few seconds with the water running and voilà. If you cannot have a garbage disposer, having a compost bin in the back yard (if you have one) is a great way of taking the scrap food out of the house and making sure it does not rot in the bin. You can have a big bowl on the top of the kitchen bench/counter and at the end of the day, you can take it outside to the compost bin. One disadvantage is that on hot days, the flies love it too and do not wait for it to be outside, but if you have a vegetable patch, those same flies help make the food into fertilizer in return. Buy stick-on air fresheners and attach to the bin. That worked for me for a while, but the air fresheners kept falling off. I bought some with double-sided tape to stick them on better, but they still fell after while, so I gave up. If you can make them stick or just put them in the bin cupboard, it may work for you. Scented plastic trash bags are my new thing. I keep them in the cupboard above the bin, so they make a good smell there all the time, but they also surround the garbage with a nice scent. Having a bin with a lid helps prevent the smell from spreading in the kitchen, but it makes it a hassle to throw things into the bin. We have tried a foot-operated lid for a while and now we have a hinged lid that swings away and then swings back into position. Neither is perfect, but they block the smell. Having trash bags with handles makes it easier to take the bag out of the bin without tearing and dripping all the way to the big bin outside. Also, handles always give you something to tie the top of the bag with, which stops the garbage smelling outside. I always buy trash bags that are a bit bigger than the size of the trash can. The heavier and fuller they are, the higher the chance they will tear, but bigger bags are designed for more weight, so they hold better. Like handles, bigger bags always have enough plastic left at the top to tie a knot and stop the smell. I also recommend having smaller bins. Yes, I know that having small bins means you need to go outside more often, but it also means you take the smell out of the house before it “matures”. The best tip I can give you is to put some used plastic shopping bags at the bottom of the bin and 3-4 layers of newspapers on top of them. Then, put your large, scented trash bag (with handles). 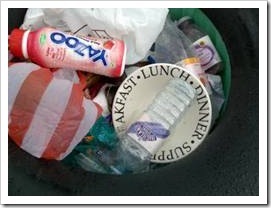 The drippings can be horribly smelly even if the food was in the bin for one day, so the newspaper absorbs some of it, while the plastic bags prevent it from reaching the bin itself. Worst case, you throw the whole lot out with the trash and start over. If you have another tip for handing smelly bins, please share below. I have found this website http://www.greentimes.com.au/current_competition/GTC022-bamboo/competition.php where you can win very powerful and organic air refreshing deodorizers made with bamboo charcoal (i already use them). So if you have problems with strong and stale smells around you, this is a solution! Good thing that I have a garbage disposer in my home! I like to recommend you to read a garbage disposal reviews if you want to purchase a unit.